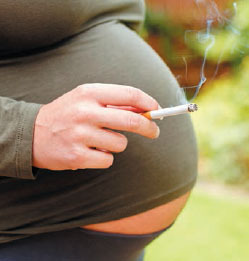 In England, around 70,000 babies every year are born to mothers who smoke. Smoking during pregnancy causes up to 2,200 premature births, 5,000 miscarriages and 300 perinatal deaths every year in the UK, says the Royal College of Physicians. Treating mothers and their babies with problems caused by smoking in pregnancy is estimated to cost the NHS between £20 million and £87.5 million each year, according to researchers at the University of York. The Smoking in Pregnancy Challenge Group’s latest report, published last month, shows that the rate of smoking in pregnancy has fallen below the government target of 11% for the first time – down from more than 13% in 2011/12. However, the report says this figure conceals large disparities in rates of smoking in pregnancy between wealthier and poorer communities. It also sets out recommendations for how a new government strategy could halve the current rate of smoking in pregnancy over the next five years. Established in 2012, the challenge group is a collaboration of charities, academia and royal colleges, including Action on Smoking (ASH) and the RCN. Smoking is the single biggest modifiable risk factor for poor birth outcomes, including pre-term and low-birth-weight babies. It increases the risk of sudden infant death syndrome, as well as the risk of developing a number of respiratory conditions, diabetes, attention and hyperactivity difficulties, obesity and problems of the ear, nose and throat. Women in poorer areas in England are much more likely to be smokers at the time their baby is born than those in wealthier areas, says the Challenge Group’s report. For example, in the Westminster area of London, 2.1% of pregnant women smoke, compared with 27.2% in Blackpool. Pregnant women with unskilled occupations are five times more likely to smoke than those in professional occupations, while teenagers in England are six times more likely to smoke than older mothers. Resources that inform pregnant women about the risks of smoking in pregnancy, the benefits of stopping and the help that is available are crucial in prompting attempts to quit, says ASH. All healthcare professionals who come into contact with pregnant women should be able to refer them to services that can help, and it is important to avoid being judgemental. ‘I have always believed that most pregnant women who smoke know that it is harmful to them and their baby and are motivated to change. But smoking is an addiction as well as a crutch. So we need to look at smoking in the context of social issues and life difficulties that may conspire against women’s attempts to stop.